This year I decided to jump on the band wagon and buy myself a set of mini dessert glasses. 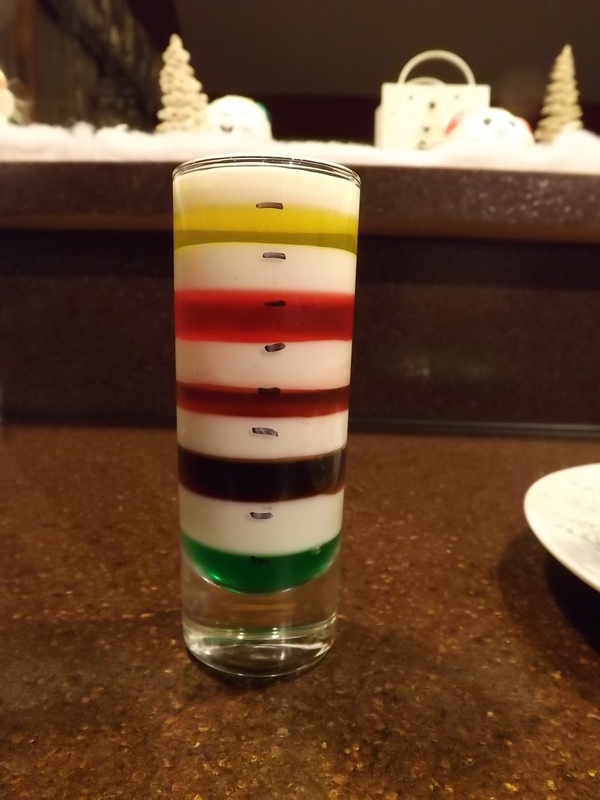 For the past two weeks I have been experimenting with a bunch of different recipes using these glasses. I really like serving desserts in this fashion because I can make five or more different desserts and being that the servings are so small, my guests can experiment with several of them without risk of over-eating. 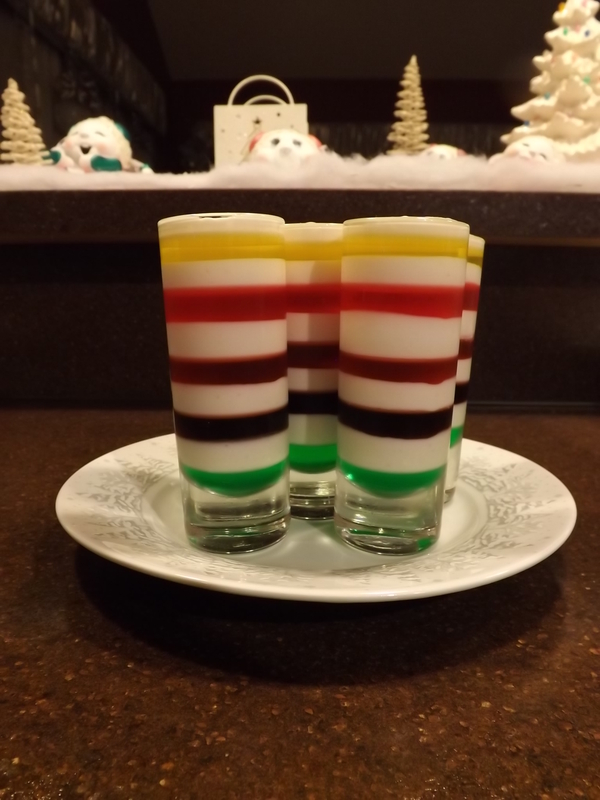 Today I decided that I just didn’t have enough on my plate to do, so having a good 8 to 10 hours to kill, between making dinner, baking cookies, making candy, going on a day trip with Hubby and the kids, and doing a few loads of laundry, I made these wonderfully time-consuming layered jello desserts. It’s really not that difficult to make, just terribly time-consuming. So if you’ve got time to kill, or just really want to serve something that looks really pretty, give this recipe a shot. Begin by dissolving first flavor of Jello in 1 cup boiling water. Add 1/4 cup cold water. Pour first layer into glass. I marked one of the glasses with a marker to give me a guide. The glass was 3″ and I had 10 layers that I planned on making. After I filled the amount of glasses I wanted to make, I poured the remaining jello in a rectangle corning ware dish. The original recipe called for only four different flavors of Jello and a 9 x 13 pan was used. Put the glasses in the refrigerator to set. The small glasses take about 30 minutes, whereas the corning ware dishes take 45 minutes to an hour. Add sugar to boiling milk and mix till dissolved. Dissolve Knox gelatin in 1/2 Cup cold water. Let set 5 minutes. Add gelatin mixture to milk and sugar. Add sour cream and vanilla and mix until blended. Let cool. DO NOT REFRIGERATE CREAM MIXTURE AT ALL UNTIL YOU LAYER IT GLASSES. When first layer of Jello is set, pour a layer of cream mixture on top and return to fridge. Let this layer set for 20 to 30 minutes. Meanwhile, prepare the next two flavors of Jello in the same manner as before and let stand OUT OF THE REFRIGERATOR TO COOL. When cream layer is set, pour next flavor of Jello on top to make next layer and refrigerate. After each layer of cream has been added from here on, immediately prepare another Jello flavor and let it stand OUT OF THE REFRIGERATOR TO COOL. You do not want it to gel at all, but it must be cool. I cannot wait to serve these to our guests tomorrow. Even if they don’t like Jello, I think they’ll find them irresistible. These little desserts took a long time to make, but they were well worth the effort. Remember, there’s always room for Jello, and for this I am — Simply Grateful.